BOMB PROOF® Selectorized Dual Tricep Training Machine - The BP-109 is an American Made Selectorized Dual Tricep Machine that features a tricep pushdown and tricep extension in one single footprint. The BP-109 allows users to hit all three heads of the triceps for maximum muscle and strength gains. Its also ideal for performing super sets and drop sets for igniting the triceps. 2 x 2 x 11 gauge steel tubing and high grade hardware provides a commercial foundation for solid performance and increased longevity in harsh commercial environments. The BP-109 utilizes one single aircraft quality cable and a single 200 lb. stack for a simple design that is always easy to maintain. Hardened and polished steel guide rods and nylon pulley wheels with sealed bearings are included to ensure smooth weight stack travel. To accommodate users of all sizes when performing seated tricep extensions, or French presses, the seat is fully adjustable in 1 increments from 17 to 24 high. And an included tricep extension cradle allows easy access to the extension handle when training alone. 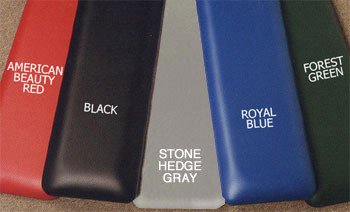 Choose your favorite powder coat and vinyl colors per the drop down menu at no extra charge. Need custom colors to match existing equipment? Call an Ironcompany strength equipment specialist today for availability.